I wasn’t expecting this, but I think I may have found the one. In line with Project #LifestyleChange, I’ve decided to switch my entire beauty regimen to an all-natural, eco-friendly, community-beneficial, and environmentally-sustainable system. I’m starting with bath and hair products, and then eventually try to convince my mom to switch all her household cleaners as well. It should be easy enough. Makeup, however, is a different story. There aren’t too many eco-friendly cosmetics brands available in the Philippines, and they can be quite expensive, so that will take time. But, for now, bath and body care! There are several brands championing the natural, eco-friendly, and sustainable cause, which have gained some cult followings over the years. Off the top of my head, they are Human Nature, Messy Bessy, Ilog Maria, and more recently, G-Stuff. G-Stuff‘s products — food, home care, personal care, beauty, and wellness — claim to have no [harmful] chemicals, no preservatives, no white sugar, and no white flour. Their VCO-based products support the indigenous communities of Brooke’s Point, Palawan. I was hesitant to commit to this switch at first because I was sure that finding products that could properly deal with my wild, wild hair would be sort of a needle-in-a-haystack situation. The other products I’ve tried before have either left my scalp really oily, or my hair really crunchy, stiff, and tangled. 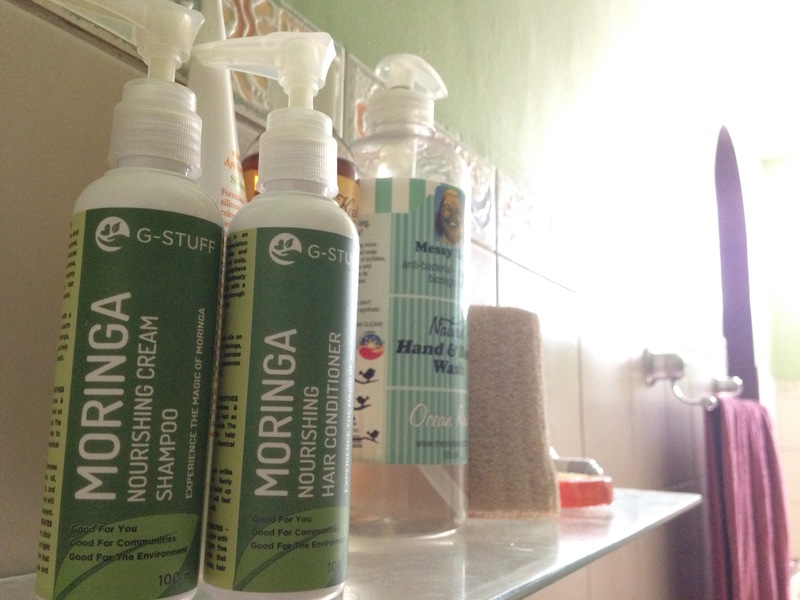 I took a chance on G-Stuff’s moringa shampoo and conditioner pairing, hoping for the best, but expecting the worst. G-Stuff’s Moringa Nourishing Cream Shampoo was a gentle, but effective cleanser. It is eco-certified 100% natural, and smells like fruit chewing gum (at least in the bottle). Upon rinsing, I expected it to leave my hair tangled and rough, as was with my past experience with other products. Surprisingly, it rinsed smoothly — I could run my fingers through my hair, and I hadn’t even conditioned yet! The Moringa Nourishing Hair Conditioner — I had absolutely no expectations. I cannot stress this enough. I’d been burned by natural conditioners in the past, and just did not want to get my hopes up. As with previous experience, it felt a little bit too lightweight when I slathered it on. And you do not understand: my hair being wavy-curly, it is a bit on the coarse side. And anything less than a super thick formula normally does not take much effect. But it ain’t over ’til it’s over! Surprisingly, it held its own. It was lovely, and made my hair so smooth. It took care of all the tangles. No crunch, no dryness, no Hallelujah! Can I get an “amen” up in here! Bonus feature: you’ll manage without it, but it’s good to know that the added use of the Hair Shine serum just makes things extra-luscious. A mix of virgin coconut oil, aloe vera extract, and Vitamin E, it’s a sure shine, regardless of how dry or coarse your hair might be. I tested it on two separate situations: the first with dry hair, and the next with wet, fresh-out-of-the-shower hair. With the former, it felt a little too oily, a bit sticky, and it caused my hair to tangle a bit. But when applied on wet hair, the results are amazing! It gave my hair a proper, natural-looking shine, without making it look like a synthetic wig. All things considered, the G-Stuff hair product line seems to have that magical formula that has enough control to do away with the frizz, but is light and gentle enough to keep my curls bouncy! In fact, my hair is more buoyant now with these products than they were when I was using a synthetic, commercial system. My hair used to feel like a cross between a cloud, and hay. Now, I might describe it as tousled, yet defined — just the way I want it. And even with day-after hair, it’s still smooth, untangled, and not oily. The best thing about them is that they are paraben-, phtalate-, petrochemical-, propylene glycole-, and chemical preservative-free. And they are fairly-traded and sustainably sourced from local communities. Per G-Stuff’s Facebook page, 100% of the proceeds that these products generate (at least the shampoo and conditioner, confidently) go directly back to the communities that the company supports. So, not only are you taking care of yourself with quality products, you are doing it with products which are socially- and environmentally-conscious. Sounds winning to me! G-Stuff is located at the 3rd Floor, Rockwell Power Plant Mall, Makati. This entry was posted in #LifestyleChange, Words and tagged beauty, G-Stuff, hair, local, products. Bookmark the permalink.